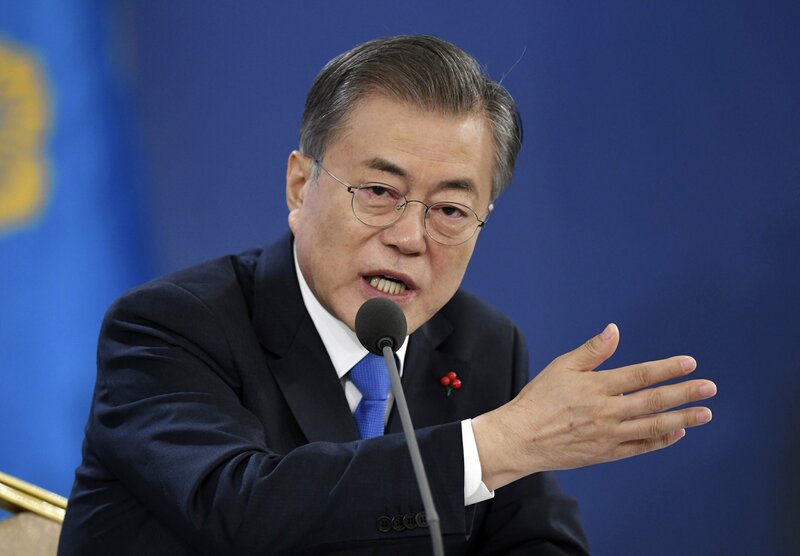 SEOUL, South Korea — South Korean President Moon Jae-in urged North Korea to take bolder disarmament measures that the United States should then reward, suggesting Thursday he wants harsh sanctions lifted so Seoul can eventually restart dormant economic cooperation projects with the North. Some observers believe that any sanctions relief, if pursued before South Korea’s ally Washington is ready, could weaken ties with the United States and complicate efforts to rid the North of its nuclear weapons. Others see the comments by Moon, a liberal who covets deep engagement with Pyongyang, as simply a symbolic bit of conciliation toward North Korea. Moon spoke only days after North Korean leader Kim Jong Un said in a New Year’s Day address that he was ready to resume two major stalled inter-Korean projects. Kim also said he’ll be compelled to take a different path if the United States keeps pressing for unilateral sanctions against the North as well as maintaining broader U.N. sanctions. The two projects are South Korean tours to the North’s scenic Diamond Mountain and a jointly run factory complex in the North Korean border town of Kaesong. They were suspended in the past decade along with other similar projects amid the standoff over North Korea’s nuclear program. The two projects were considered key sources of badly needed foreign currency for the impoverished North. “My administration will cooperate with the international community, including the United States, to resolve the remaining issues such as international sanctions as soon as possible” to get the two projects restarted, Moon told a news conference. Moon said resolving the issue of the North Korea sanctions hinges on how fast North Korea denuclearizes and whether it receives reciprocal measures from the United States. He said those would top the agenda in an expected second summit between Kim and President Donald Trump. “North Korea knows it needs (to take) clear denuclearization steps to see international sanctions lifted and the United States also realizes that reciprocal measures are needed to match these North Korean denuclearization steps,” Moon said. Moon, who took office in 2017, has shuttled between North Korea and the United States to facilitate high-profile nuclear diplomacy that includes the first Kim-Trump summit in Singapore last June. Moon’s overture, however, has invited criticism from conservatives in South Korea and the United States that he’s making too many concessions and helping the North try to weaken U.S.-led sanctions. Trump has maintained that sanctions on North Korea will stay in place until it completely abandons its nuclear program. As Moon spoke, Kim was heading back to Pyongyang after a two-day trip to his country’s only major ally China that included a summit with President Xi Jinping. Chinese and North Korean state media reported earlier Thursday that Kim told Xi that he’s committed to setting up a second summit with Trump to “achieve results” on the nuclear issue. “In a word, Chairman Kim Jong Un’s visit to China is an indication that the second North Korea-U.S. summit is drawing near,” Moon said. The North, which previously used the term to request the removal of 28,500 U.S. troops in South Korea, said in December that it would never unilaterally give up its nuclear weapons unless the United States first removes what it calls an American nuclear threat. The North’s Foreign Ministry statement further raised questions about whether the country is truly committed to denuclearization. Moon, who met Kim three times last year, reiterated his previous stance that Kim won’t link denuclearization to the U.S. military presence in South Korea. Moon also said Thursday that Kim told him that the denuclearization steps he was talking about were not different from what the international community wants.